Learn Japanese Traditional Shiatsu in 8 weeks! The Shiatsu Foundation Certificate Course is delivered to complete for 8 weeks (144 hours). 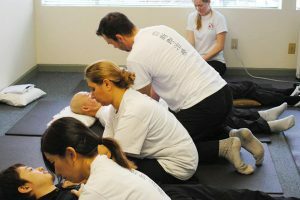 Students learn the basic Shiatsu skill which includes Shiatsu theory, self-Shiatsu, Chair-Shiatsu and whole body treatment. Upon successful completion of this course, students will receive a certificate which is transferable to the 1070-hour Shiatsupractor diploma program. The basic whole body treatment, which takes 75 to 90 minutes to complete, which includes up to 660 Shiatsu points on entire body. The whole body treatment is taught in stages, gradually increasing the duration of time until the complete treatment is mastered. Uniform, equipment, clinical report file, handout and student record are included in additional fee. The equipment includes buckwheat pillow for the practical classes, if you are allergic to buckwheat, please let us know before you make payment. ** Additional Fee is not included in Total Program Fee.